If you’re looking for a dynamite casserole, one that practically screams “comfort” and one that’s easy to make, serves a crowd and comes in at a budget, this is the one, Cheesy Chicken or Turkey Noodle Casserole. 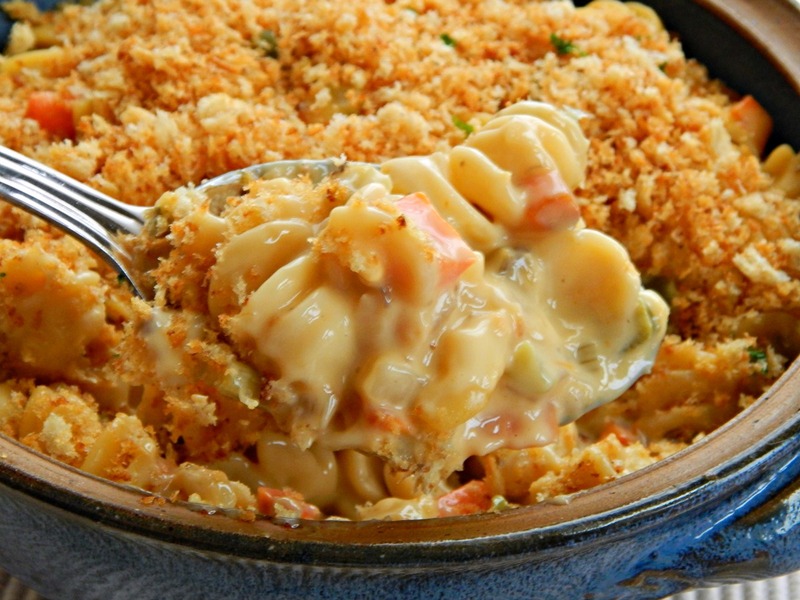 Cheesy Chicken or Turkey Noodle Casserole is truly a family favorite. My version of this casserole was inspired by a friend of my Mom’s who put out a little cookbook called “If it’s Good, it’s Gourmet.” Her’s was a lot fancier and used green Spinach noodles, mushrooms, and sliced green olives, along with a beautiful sprinkling of slivered almonds across the top. I needed fast, filling family food my kids would eat, so the casserole morphed over the years. Rototini catches the wonderful sauce, the mushrooms are replaced by carrots, olives are omitted and who can deny how gorgeous the breadcrumb topping is? The bottom line: Who has time to argue about food when kids are involved? The recipe originally called for chicken and when I serve chicken early in the week, I sometimes make extra just for this dish. Cheesy Chicken or Turkey Noodle Casserole is also a go-to recipe for us after Thanksgiving Turkey. All that just goes to show, though, how versatile and forgiving Cheesy Chicken or Turkey Noodle Casserole is. Because the recipe makes a large amount, this is the casserole I turn to when a friend is ailing or had a loss; I simply divide it in two and I have dinner for my family and theirs. Unless I’m serving a crowd, I divide Cheesy Chicken or Turkey Noodle Casserole in two anyway and freeze half for later. I just put the topping in a Ziploc and put it on top of the casserole so it can be added when it’s time to take it out of the freezer and heat it. As far as how this is made? It has Velveeta and canned soup and really can’t be any simpler. Let that be our little secret! It’s sad to feel “food-shamed” because of a little Velveeta and canned soup. That being said, Cheesy Chicken or Turkey Noodle Casserole can be made with a white sauce and grated cheese. Buy chicken at a low (it usually drops to a low price at least once a quarter) and stock up. Break it down into portions your family uses and freeze. If you use the Velveeta, do watch for sales and coupons. I often see it on special during the winter holidays, around Easter and midsummer. Look for special at the store where Velveeta might be included in those sales, buy so many Kraft items, get a discount or get money back for your next store purchase. Pantry items like noodles and canned soup are great items to watch for on sale and to pick up at a bargain price. Canned soup is usually at a low during the fall and often on sale during holidays. If you use a coupon matching site, you’ll likely find both items can be picked up for free or near free. Veggies like carrots, celery, and onions are seldom on sale unless it’s a holiday week, but do look for sale prices on any peppers. When they’re on sale buy what you need and then buy extra for the following week. Green peppers are generally less than the yellow, orange or red peppers. A big hearty casserole that everyone loves! May be divided in two and freezes beautifully. Cook noodles until al dente, drain and set aside. Saute vegetables in the butter until tender. Cube up Velveeta and melt in the microwave in a large bowl with the soups until melted, about 2 to 3 minutes, stirring every minute or so. Watch carefully as it can scorch. Add the sautéed vegetables and chicken (or turkey) to the Velveeta mixture. Add a little broth if needed – should be creamy, not thick and gloppy. Fold in pasta. Give it a gentle stir and add a little more additional broth if needed. The consistency should be thick but still able to “flow” over and through the pasta. Bake at 350 degrees for about 20 to 25 minutes until warmed through and bubbly. Top with almonds or breadcrumbs during last 15 minutes. This may be made ahead; it refrigerated, bake for about 35 to 40 minutes, adding almonds or bread crumbs during the last 15 minutes. To Freeze Casserole: Line casserole with foil, letting foil overhang dish is such a way that the casserole can be completely wrapped. Fill with the casserole, then fold foil up and over when frozen. Wrap a second time and label. To bake: Unwrap the first layer of foil, plop it into the casserole dish in the initial layer of foil and thaw overnight in the refrigerator. Bake as directed above, may need to add a few minutes time. If making this recipe starting with raw rather than cooked poultry, simmer about 2 small or one very large chicken breast in water until cooked through, about 10 to 12 minutes. Reserve the cooking liquid and use that instead of broth. This entry was posted in Click here for Bargain Meals, Click here for Fabulous Food Posts and tagged Bargain Meal of the Week, Canned Soup, Casserole, Chicken, Family Recipe, Freezes Well, leftover Chicken, Leftovers, Pasta, planned leftovers, Turkey, Turkey Leftovers, Velveeta, White sauce. Bookmark the permalink. I loved the blend of creamy cheesiness and delicious crunchy topping great dish for a big family to enjoy! Thanks Kraig and Tweety! This has always been one of Kraig’s favorites – I’ll make it for both of you guys next time I’m home! Kisses & hugs & Happy Fourth!!! I made this for a friend who had a surgery and needed something to tide her over and it was a huge hit at her house! I wish I would have kept some for me – but I tasted it when I was putting it in the casserole dish and it was really good. I’m glad they liked it. Never underestimate the power of comfort food when someone is down and out! Very good and easy to make. Thank you. I’m glad you enjoyed it and took the time to reply – it’s nice to hear!.